Fascinated to watch Philips Corporate Communications in Amsterdam roll out several productions connected with the 100th anniversary of the founding of their research labs. I think they actually did more to pioneer radio than they give themselves credit for. 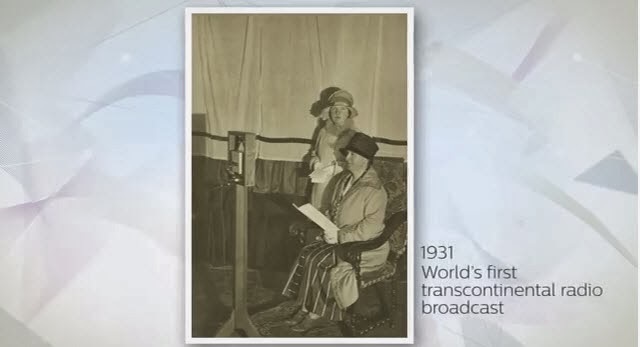 I'm puzzled by the image of Dutch Queen Wilhemina at 1'42 into the video where it is claimed Philips made the world's first transcontinental radio broadcast. Actually this was all much earlier. Dutch radio pioneer Steringa Idzderda was broadcasting music programmes to the UK, sponsored by the Daily Mail, in 1919. Philips did pioneering experiments with shortwave as early as 1925 (testing the path to what is now Indonesia). And my copy of that photo of Queen Wilhelmina is marked as June 1st 1927. PCJ publicity in the New York Times in 1929 also refer to the broadcast. So it must have been earlier than 1931.